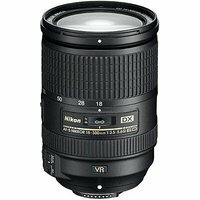 The Nikon 18-300mm f/3.5-5.6G AF-S ED VR Lens is an all-in-one, DX format 16.7x zoom lens with a versatile zoom range from wide-angle to super-telephoto. This lens boasts Nikon's second generation Vibration Reduction system to ensure sharp results, even when shooting handheld at the super-telephoto end of the range. This lens features Nikon's ED (Extra-low Dispersion) glass which is designed to minimise colour aberration and to ensure superior sharpness and colour correction. Built with a compact construction, the Nikon 18-300mm f/3.5-5.6G AF-S ED VR Lens offers a wide range of shooting options in a body that's easily portable and compact making it perfect partner for travel.